In 2017, the Farmer-to-Farmer (F2F) initiative continued the progress made in Mali, West Africa, the previous year. Twelve volunteers participated in 11 assignments, which benefited 3,765 family members. 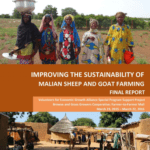 This report marks the end of the first year’s successful Farmer-to-Farmer (F2F) initiative in Mali, West Africa in 2016, actualizing the concept of farmers helping farmers and cooperatives helping cooperatives. Smallholder livestock production in Mali’s rain-fed agro-pastoral systems is strongly limited by deficient levels of ruminant feeding. Crop cycles frequently dictate access to common grazing resources giving way to the smallholder’s paradox. 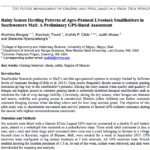 The objective of this pilot study was to characterize movement and activity patterns of herded GPS-collared ruminants during the season with highest movement/access constraints. Konimba Bengaly, Sounkalo Traoré, Andrés F. Cibils, Judith Moses,and Shelemia Nyamurekung’e (2016 Proceedings of the 10th International Rangeland Congress 1084). 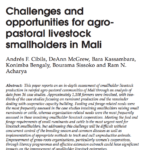 This paper reports on an in-depth assessment of smallholder livestock production in rainfed agro-pastoral communities of Mali through an analysis of data from 36 cases. 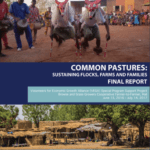 Approximately 1,108 farmers were involved, with two-thirds of the case studies focusing on ruminant production and the remainder dealing with cooperative capacity building. Andrés F. Cibils, DeAnn McGrew, Bara Kassambara, Konimba Bengaly, Bourama Sissoko and Ram N. Acharya. (Outlook on Agriculture Vol 44, No 1, 2015, pp 69–80 doi: 10.5367/oa.2015.0198).